This boat has a unique combination of exceptional interior and exterior living space. The interior includes a forward state room, a two bunk side room, a kitchen with a 3/4 frig, full stove and wet bar with ice maker. the living area has newly re-upolstered sofa and seating around the Kitchen table area. The interior also has a bath with seperate shower. The exterior has a large rear deck and a very large skybridge area with wrap around seating and a large rear two tear bench seat. the upper skybridge area has seating for plenty. The front deck has a factory lounge seat. 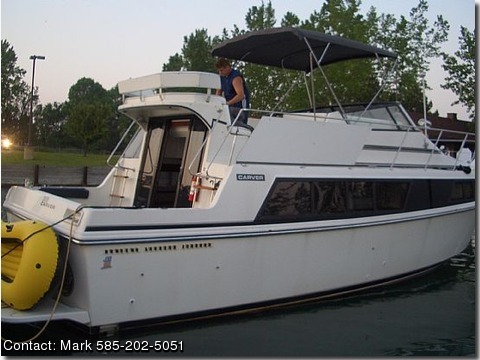 Other boat items include new canvass, power wench, GPS, generator and newer stereo system.